Home / Horse Shows / Canadian Eastern Dressage Championships-Wow! What a Weekend! 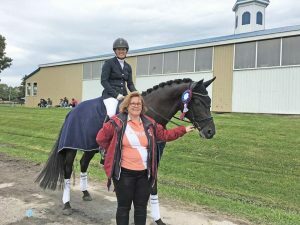 Two horses, Beaujolais and Feng de Lys, one rider Lynsey Rowan, and one trainer, Belinda Trussell all add up to two Canadian Eastern Championships! Photo: Lynsey, Feng, and owner Linda Jodoin.